An easy to use web analytics tools. It is one of the best web analytics tool to convert your visitors into leads. This software has in-app support using which you can clear your technical doubts in a single click. It also has Whoisidentify add-on feature, using which you can identify the visitors of your web page as well as you can get their contact details. In addition, it has trigger setting which helps you to set up a criteria and when it is met you will receive notifications or alerts. Moreover, it is compatible with Salesforce using which you can upload your visitors into your Salesforce account. Using this software, you can receive notifications about the companies visiting your websites in real-time. How much does Whoisvisiting cost ? The pricing for Whoisvisiting starts at $49.0 per month. Whoisvisiting has 4 different plans such as - Starting at $49.0 per month, Starting at $69.0 per month, Starting at $99.0 per month and Starting at $149.0 per month. Disclaimer: The pricing details were last updated on 12/04/2018 from the vendor website and may be different from actual. Please confirm with the vendor website before purchasing. Pros: I can see what companies are visiting my website, which pages they are interested in and how long they are spending there. Cons: features are somewhat limited. the UI is kind of repetitive between the top and side. A great value platform that has paid for itself many times over. Pros: It's straightforward to use, very intuitive interface. Pros: The ability to see potential contacts from the organization, how they got to our site. Cons: The reports being in a CSV instead of a PDF that looks like the dashboard isn't very intuitive. Overall: We've realized that our blogs get the most traffic and what types of blogs we should be publishing to rank higher on Search Engines for organic posts. Cons: Many tracked visitors can only be tracked to the internet supplier, but that is probably just the way it is with visitor tracking in general. Would like to see an automatic forwarding function and as I understand this is coming soon in the next release. Pros: EASY TO USE, CAN ACCESS FROM ANYWHERE, AND ALWAYS BE UP TO DATE. Overall: EASY TO USE AND HAVE GIVEN US MANY NEW CUSTOMERS! 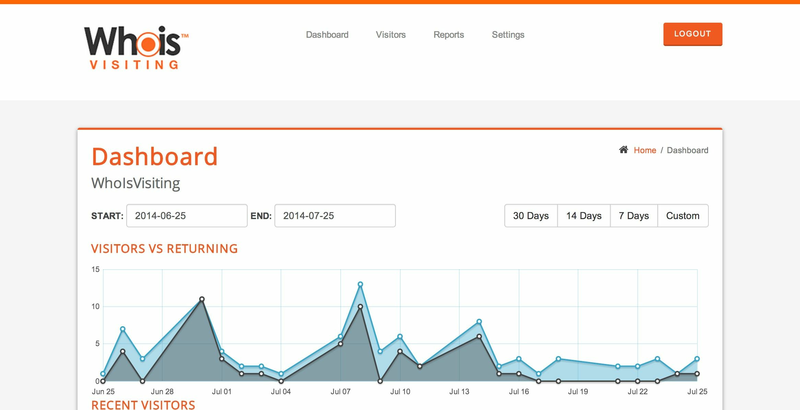 25% annual revenue growth since using the platform - and still going! Pros: - Well, what's not to like? This software drastically improved the performance of our company and we have seen revenue fly through the roof since working with Who Is Visiting 18 months ago. - What makes this software stand out is the fantastic sales support. I was new to this sort of software and so was a novice when it came to setting up reporting. They helped me set up various reports, with different triggers etc and offered valuable insights. With their help, I managed to ensure that the reports that were the most useful were set up - and going to the right people in our organisation! Cons: I wouldn't necessarily say this is a con, but it's a suggestion to improve. I'd love to see a mobile app! Their website is of course mobile-friendly, but so many companies these days are now established on an app platform, so that would be great to see and would make the process effortless, anywhere, anytime. Overall: Awesome experience, will continue working with these guys for the foreseeable future. Cons: There could be some functionality to view sub accounts statistics and change log. Overall: I started using Whois Visiting in the hope that we would be able to catch the leads that drop off our landing pages, after a few weeks of getting used to the system we managed to start converting 5% of drop offs in to customers. Having used Whois Visiting for 2 years+ I have watched the constant growth and improvement to their system. They are about to launch a full API which I am beta testing and it is working well so far. Pros: Fantastic software, a lot cheaper than other providers, the software is always being improved. Great interface that has no faults when performing actions. The company makes changes that improve the software massively and they are always on hand to help with any support queries I have. Cons: I'd love to see the actual person visiting however, with the GDPR world we live in I don't think this will ever be possible. Overall: Very impressed with the software to date. 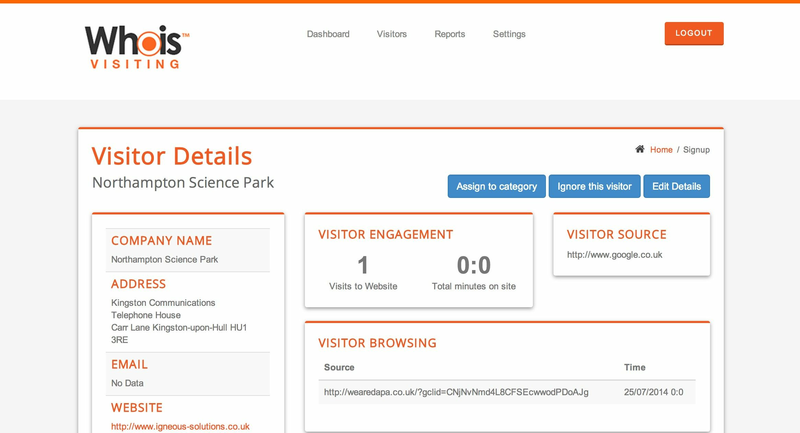 Great visitor tracking software, very effective and great customer service! Cons: - the ability to personalise the reports - however after questioning this, it is being looked into. Overall: The overall experience has been extremely helpful with finding out what people are looking at and finding on our website which allows us to improve, develop further and understand our customers (prospective) more. The customer service has been very prompt and helpful- I would recommend WhoIsVisiting to anyone! Pros: Very easy to use, and the ability to see businesses who come to your site as well as ISP's to see how much traffic is coming. Cons: The mobile site is very responsive, Could have the option of using an app but I think this feature is coming soon.